In sum, Muslims as well as believers in all religions have always grappled with how to religiously understand and explain developments in society. In more recent times, the many interpretations that exist regarding almost all issues in human life display a plurality of opinions on the ‘true’ meaning of Islam. 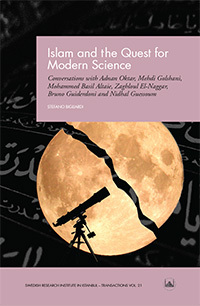 Islam and the Quest for Modern Science is an excellent introduction to questions that, from a Muslim and confessional position, can be understood either as a challenge, a threat or a possibility. Muslim approaches, confessional or not, toward modern science are undoubtedly diverse, and how to Islamically understand modern science is a key topic at the core of today’s discussion on the function of Islam. Therefore, this book is an important contribution that not only fills a gap in the study of Islam, but also portrays a discourse that touches upon fundamental questions in the production of Islamic theologies and the understanding of Islam among Muslims in general.